On Thursday I took my sisters to the park. Not out of kindness, you understand, but for my Maths coursework. 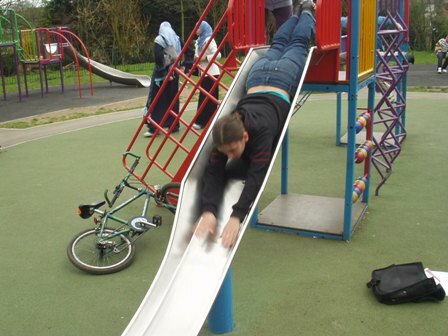 We have to design a children’s slide, so I wanted to measure average velocities and acceleration and suchlike. 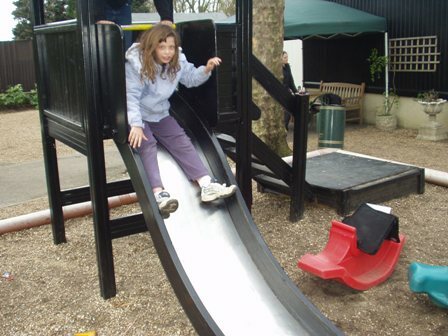 We even persuaded a woman there to let us measure the time for her son to down, which was very nice of her, especially considering I sold it as “Hiya, I’m doing some Maths coursework looking at how fast people go down slides without dying.” See kids, you all want to do AS Maths now I bet. Slides! Yesterday I regrettably did not do any Maths coursework but I did go to Hampstead Heath with (deep breath) Matthew, Joshua, Fabio, Robert, Sanna, Olly and Olly’s mysterious friend Alex. We all held hands and ran down hills – looking for all the world like a gay pride rally – and also flew a kite! We also sunbathed, investigated a Viking burial ground, walked through the carnival and bought some candy floss. Funness. Plus tonight we’re off to the National Theatre (The Royal Hunt of the Sun) while we record… the launch of the new series of Doctor Who. Make sure you all watch New Earth, tonight, at 7.15 on BBC1! Phew. P.S. How could I forget? Check out the music of Lily Allen for some brilliant songs. I’d like to place a bet on how long it takes for you to get arrested by the goverment who think that you’re trying to build a slide to send kids into orbit. Every satelite comunication who be a message saying "sorry but my mummy and daddy aren’t home at the moment". Now thats a weapon of mass distraction.